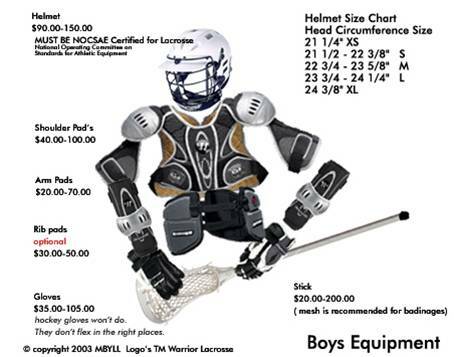 Equipment for Boys and Girls does vary so please check out the guidelines below when considering what equipment to purchase for your player. You can buy starter sets that include a stick and goggles at online sites like comlax.com or lax.com from $50 to $90. You can buy starter sets at online sites like comlax.com or lax.com from $80 and up. These sets include helmet, shoulder pads, gloves and stick.